Sandwich terns Thalasseus sandvicensis are visual hunters that use aerial plunge diving as their main foraging technique. They are specialised fish eaters, foraging mainly on Herring Clupea harengus, Sprat Sprattus sprattus and sandeels Ammodytidae. In the Wadden Sea area the total number of breeding pairs of Sandwich terns is estimated at 12,000. 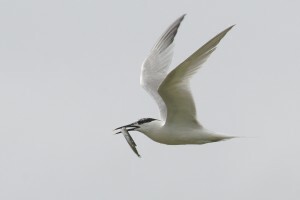 It is known that Sandwich terns breeding in the Wadden Sea at Griend, Ameland and Texel use the ebb-tidal deltas of the islands as main foraging ground. Ebb-tidal deltas are dynamic environments with deep gullies, shallow subtidal banks and shoals that lie in the North Sea coastal zone between the Wadden islands. It is not known precisely in which parts of the ebb-tidal delta the Sandwich terns forage for fish. In view of the increasing pressures on ebb-tidal deltas, through sand nourishments and navigational dredging, it is important to know which parts of the ebb-tidal deltas are important to Sandwich terns. 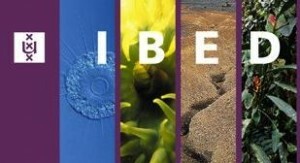 The aim in this research project, therefore, is to pinpoint the foraging locations in an ebb-tidal delta as precise as possible. On the Wadden Sea island Texel, the Netherlands, the nature area Utopia (53.1241oN 4.8957oE) hosts a large colony of Sandwich Terns. Numbers of breeding pairs in 2014 -2017 ranged between 2,736-7,103. Together with another colony on Texel in nature area Wagejot (53,0895°N, 4,8981°E) total numbers of breeding pairs on Texel were estimated in 2014-2017 at 7,022-7,440. In the breeding period these terns forage in the ebb-tidal delta Eijerlandse Gat between Texel and Vlieland to feed their chicks. on to establish their foraging locations and we subsequently track their GPS-positions with low frequency to establish their general distribution.